If there is one thing that is universal among all humans it is our need to protect our skin from the damaging and harmful effects of the sun. Regardless of our skin tone or ethnicity, we are all vulnerable to the damaging effects of UVA and UVB rays that cause photo aging and skin cancer. As a Fair American who resides in Arizona, I must work hard to protect my delicate, porcelain flower face and not so delicate rest of me from the harsh, hot desert sun. I do this is a variety of ways. Shelter: I stay indoors and under cover as much as I can when the sun is up, especially during peak sun hours. I want as much solid architecture between me and Old Sol as I can get! Hats and Sunnies: A broad brimmed hat can protect my face, ears and the back of my neck, UV blocking sunglasses stylishly keep my peepers safe from harm. Sunscreen: Mineral based sunscreens are my jam. I can't tolerate any chemical sunscreen ingredients so I rely on physical/mineral to give me the protection I need. I slather the stuff on all over, making sure that I am liberal, apply in an unbroken layer and reapply after a few hours or after I get sweaty or wet. Living in my handbag is a slender, brush topped tube of Brush on Block. This portable powder mineral sunscreen is my new go to for touch up and small area protection while out and about. The soft, synthetic brush buffs the 15% Titanium Dioxide, 12% non nano Zinc Oxide broad spectrum SPF 30 into my skin quickly and easily. A shake, shake, buff, buff and I'm protected. The powder is finely milled and translucent; once buffed into the skin the finish is sheer and nearly undetectable. There is the slightest of coverage but it should be compatible with many skin tones from fair to deep. I don't use this little brush for all over my bod protection... I'd be at it all day! But for quick coverage on small areas, such as my face, ears, the back of my neck, decollete, tops of my hands, the part in my hair... 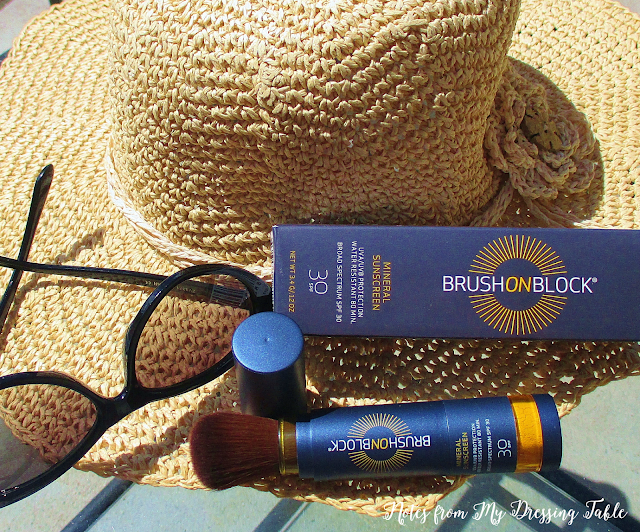 I use Brush On Block on my face over makeup if I feel that the sunscreen I applied earlier needs a little extra oomph. I often need extra protection on the top of my left arm while out running around all day long in my car and this is great for that! Brush on Block is sweat and water resistant up to eighty minutes so no worries if you are exercising, take a dip or get caught in a sudden rainstorm. 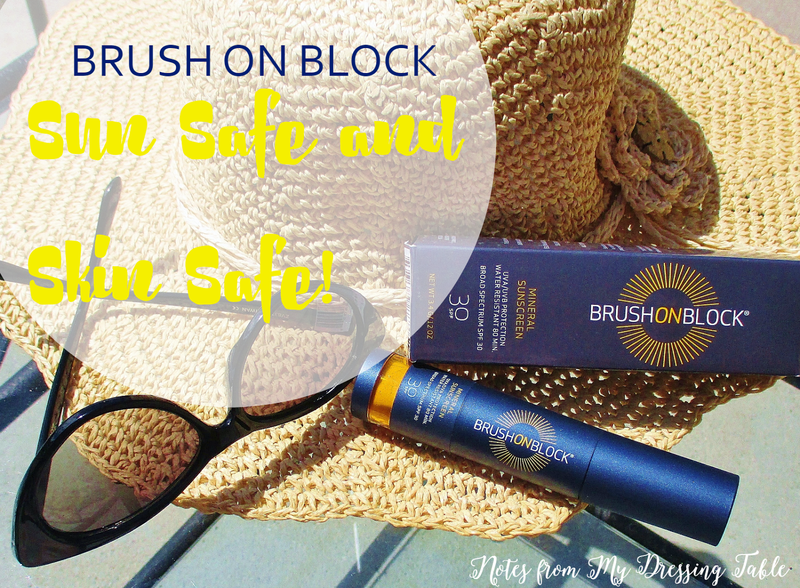 Brush on Block may be a wonderful sunscreen for moms with little ones to give them fast, easy sunscreen protection on delicate little faces, arms, hands and feet. Kids don't usually like having gloppy lotion or spray applied but may not mind this soft, bunny brush buffing their delicate skin. Make a game of it, you might just get them protected without having to tie them down. I kid. I kid. But I'm not kidding about mineral sunscreen being protection you can feel good about using on your little one's delicate skin. The mechanics of the Brush on Block tube are so well thought out. The tube is purse sized, perfect for a handbag, makeup bag, beach bag, diaper bag or tote. You can toss it in the glove compartment or center console of your car without worrying about it melting or exploding on hot days or freezing in the cold. Remove the cap and there is a yellow plastic sleeve protecting the brush. Simply push it down, the brush is ready. When you want to replace the cap, pull the sleeve back up over the brush to protect it from damage. You can control the flow of the sunscreen through the brush by simply twisting the replaceable cartridge. Twist to the left and it is open, to the right closes it to keep it from making a mess, should the cap come off while it's bouncing around in your purse or beach bag. When you run out of sunscreen, simply order a replacement cartridge, unscrew the old, reattach the new and you're back in action. Let's talk hygiene. because you know I'm a little nutty about brush cleaning. Good news is, you can clean your Brush on Block brush. Close the cartridge, screw it off of the tube, clean your brush in your preferred method, (I would simply swirl it in 91% alcohol, squeeze out the excess, gently buff it on a towel, reshape, dry in a brush guard) let dry, reattach your cartridge and you are good to go with a sparkling clean brush, once again. Brush on Block is available from the Grommet for $30,00 and refill canisters are $16.00 each. While this sounds a little spendy, remember that this should last a least a couple of months, much longer if you are using it for small area protection. Brush on Block is cruelty free, vegan, hypo allergenic and includes a washable, synthetic brush. What is your favorite portable, touch up sunscreen? Have you tried or would you try Brush on Block?